Tender chicken marinated in mild spices with yogurt and cooked in the clay oven. Chicken on bone, marinated on fresh chilli sauce with lemon herbs and spices, cooked on a clay oven. 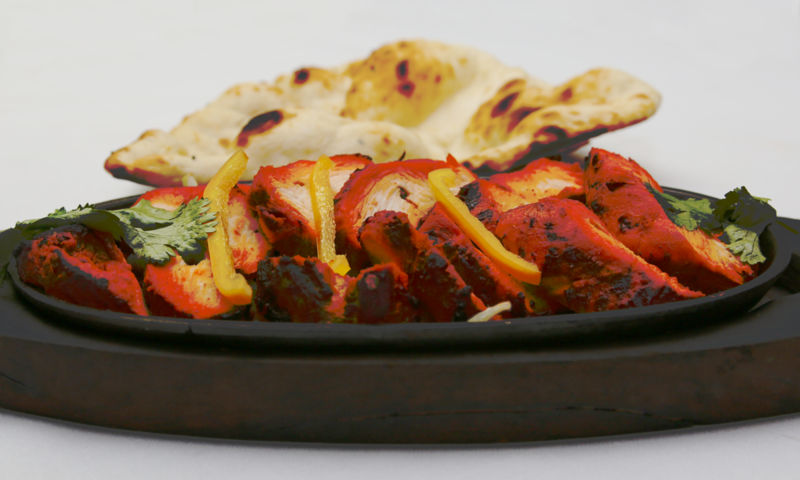 Tender pieces of chicken served off the bone, cooked with mild spices in the tandoor. Succulent pieces of spiced charcoal cooked chicken, skewered with onions, capsicum and tomatoes. Tender lamb, marinated in yoghurt and spices, cooked with onions, capsicum and tomatoes. Minced chicken, mixed with herbs and spices and grilled over charcoal in the tandoor. Minced lamb, mixed with herbs and spices and grilled over the charcoal in the tandoor. King sized prawns, lamb tikka, sheekh kebab, chicken tikka, tandoori chicken and salad. King sized prawns dipped in herbs and spices, cooked in the tandoor. Succulent pieces of spiced charcoal cooked salmon, skewered with onion, capsicum and tomato. Tender lamb on the bone grilled on charcoal.